Fotinsky, who was skilled as a painter, watercolorist, illustrator, and printmaker, was born in Odessa, Russia. His earliest studies in art were in Odessa, then, in 1904, he was admitted to the Academy of Fine Arts in Saint Petersburg. After the bloody repression in 1905 of a pacifist manifestation in front of the Winter Palace, Fotinsky went into exile. He first settled in Berlin, and then in Munich where he studied at the Academy. In 1906, Fotinsky moved to Paris where he spent most of the rest of his life. He took part in many group exhibitions, mostly in Paris. He exhibited in the Salon des Artistes Indépendants from 1912 to 1965. In 1920 he began to exhibit in the Salon d’Automne. He also took part in collective exhibitions in Limoges, Bordeaux, Reims, Grenoble, Périgueux, and elsewhere. In 1926, his work was shown in Dresden and in exhibitions of Russian art in Italy and in London. 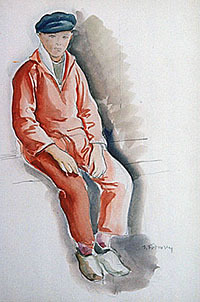 In 1926, 1927, and 1932 Fotinsky was given one-man shows at the Billier-Vorms Gallery in Paris. In 1928, he was one of the organizers of an exhibition of contemporary French painting in Moscow. Wood engravings by Fotinsky were used as illustrations for George Duhamel’s Ballades in 1926, and his prints were reproduced in a number of magazines. As a painter, he was encouraged by André Derain who found merit in his work and praised him in print. Fotinsky was allied with the French painters, between the two world wars, known as The School of Paris. He was very influenced by Cezanne.